Even though a single NanoMesh index results in repeating the same piece of geom­etry multiple times across the surface of the model, there are an abundance of settings that can be applied to give great visual variation to each Nano, hiding the repetition. All the settings below are dynamic so you can edit them and see the results in real-time. The Main settings control the aspect, orientation and duplication of the Nanos. The small preview in the Tool >> NanoMesh sub-palette is a selector. Not only does it display the existing NanoMesh Index that is applied to the current model, clicking on one of the preview icons will select the corresponding NanoMesh index. NanoMesh On mode enables or disables all NanoMeshes applied to the model. Hide Others hides all the NanoMeshes applied on the model except for the currently selected one. If you keep this mode on while switching to another NanoMesh, their visibility on the model will be swapped. This mode is similar to Solo Mode when working with SubTools. The “>>”and “<<” buttons let you cycle through the various existing NanoMesh indexes. These buttons are greyed out when you only have one Na­noMesh applied to the model. The Index slider lets you select a specific NanoMesh index from those currently applied to the model. As with the “>>” and “<<” buttons, the slider is greyed out when you only have one NanoMesh applied to the model. The Copy and Paste functions let you copy the settings from one NanoMesh index and duplicate them on another. The Edit Mesh button switches to isolate the current Nano­Mesh index’s source model, letting you modify it. It operates similarly to Solo mode when working with SubTools, hiding the placement polygons. While in this mode, you can edit the model with the various ZBrush sculpting and modeling tools. When you are satisfied with the changes, simply press the Edit Mesh but­ton again to return to NanoMesh mode. All instances will be updated with the changes you did while in Edit Mesh mode. As mentioned previously, another interesting thing that you can do with the Edit Mesh function is to create UV’s on the Nano mesh and apply textures. If you add a displacement map, this will be used during the BPR render or by an external render. When editing a Nano, keep in mind that there can be thousands of instances of it de­pending on the various duplication settings. Increasing the polygon count of the original model can exponentially increase the total polygon count of your scene. The Edit Placement mode is the reverse of Edit Mesh because it temporarily isolates the NanoMesh placement polygons. All Nanos will be hidden and you can freely edit the placement polygons themselves, similar to how Solo mode works with SubTools. While in this mode, you can edit the NanoMesh placement polygons using the various ZBrush sculpting and modeling tools. Changing the shape of the placement polygons determines how the Nano are distributed over the model. When satisfied with the changes, simply press the Edit Placement button again to quit the mode. The NanoMeshes applied to the placement polygons will have their posi­tions updated to reflect the changes made to the placement polygons. The Proportional mode keeps the shape of the inserted meshes proportional rather than being dependant on the shape of the underlying place­ment polygons. To determine the reference size, ZBrush uses the bottom part of the Nano as seen in the mesh selector preview. The Fit mode keeps the size of the inserted mesh proportional with the placement polygons. The shape of the Nano is not changed and so will not be distorted. The Fill mode resizes the inserted Nano in such a way as to completely fill the placement polygons. This result in non-uniform scaling and will distort the shape of the Nano. Fill mode and the Fit mode can be identical if the bounding box of the inserted model is cubi­cal in shape. The Constant mode, when enabled, keeps a constant height for the NanoMesh, regardless of the size of the placement polygons. The Clip mode prevents the topology of the insert mesh from going outside the placement polygons. It does this by trimming off any parts that would extend past the edges. Clip mode may result in topology issues if the Nano has a low polygon count or a shape which may result in flat parts. This is similar to what can happen with the Clip brushes. The Size slider changes the size of the NanoMesh. The origi­nal value is set by your drag motion when inserting the NanoMesh on the placement polygons through the ZModeler brush. The Width, Length and Height sliders change the proportions of the NanoMesh. A value of 1 represents 100% of the original size. These slider values are affected by the Wvar, Lvar and Hvar variation sliders. The XOffset, YOffset and ZOffset sliders change the default positions of the Nano by adjusting how it sits relative to its usual centered position on the placement polygon. The default value for the X and YOffsets is 0 while the ZOffset value defaults to 1. This is simply because the Nano’s default position is to lay on top of the surface rather than being embedded within it. These slider values are affected by the XOvar, YOvar and ZOvar variation sliders. The Tool >> NanoMesh >> XRotation, YRotation and ZRotation sliders apply a rota­tion value to the Nano’s default orientation. These slider values are affected by the XRvar, YRvar and ZYvar variation sliders. The “Var” sliders (located to the right of the size, offset and rotation sliders) apply a random variation to their corresponding attributes. Each variation can be from -100% up to 100%. As an example, the WVar slider adds a variation to the Width slider, with a result that the associated Nanos will no longer be uniform in width. Flip H and Flip V (Flip Horizontal and Flip Vertical) mirror the inserted NanoMesh either hori­zontally or vertically. The HTile and VTile (Horizontal Tile and Vertical Tile) sliders duplicate the inserted NanoMesh within the boundaries of each placement polygon. By default, this is done in a grid pattern. The replication pattern can be changed with the Pattern setting (see below). When applying tiling to the NanoMesh, its orientation may be different from one polygon to another. ZBrush uses the vertex order of each placement polygon to define Nano orientation. Unfortunately, the point order may be different between two adjacent polygons or multiple polygons, resulting in NanoMeshes not tiling in the same direction. To change a single polygon’s orientation (or that of multiple polygons) you can use the polygon Spin Edge Action associated with the A Single Poly Target of the ZModeler brush. With this Action and Target selected, simply clicking on the problem polygons will rotate the tiling. The Pattern slider and its associated pop-up selector alters the distribution of the NanoMesh inside the placement polygons when a pattern is cre­ated by the H Tile and V Tile sliders. The default pattern is a grid. To change the distribution pattern, simple change the Pattern slider value. You can also click the Pattern Selector pop-up to select a new one by name. Some pattern types may produce the same result as others, depending upon the value of the H and V Tile sliders. If you are not noticing a difference, attempt to increase the Tile values. An example showing the impact of the H and V Tile values on the different pattern types: on the left are Grid Inset and Border Inset with a value of 4 for the H and V Tile sliders, producing the exact same result. On the right, H and V Tile have been set to 8. Notice the difference between the two types of insets. The Pattern and the Pattern Selector pop-up only work the H and/or V Tile slider has a value other than 1. When enabled, the Random Distribution slider overwrites the existing NanoMesh distribution with random placement across all placement polygons. By increasing the slider value, you will increase Naon density as well as changing the distribution. The Random Distribution slider is the perfect function to create a natural look for duplicated objects because instantly hides the fact that the Nanos are all the same object. Each NanoMesh can have the orientation, size and scale of its Nanos modified by the variation sliders. Random Distribution is also applied to the H and V Tile values and its Pattern distribution, creating clusters of random meshes. The Random Seed slider modifies the Random Distribution slider’s result without affecting the distribution of the NanoMesh. To put in simple words; it changes the base randomization variables, resulting in different randomization values. This function is useful when low values for the Random Distribution slider produce placement which may not fit your design. By changing the Random Seed value, you may generate a more appropriate result. NanoMesh uses an Insert Mesh to populate the regions of the model in which it is applied, with the orientation of each Nano being determined by the point order of the placement polygons. Depending on how the model has been constructed, this order may not be uniform across the polygons. As a result, the initial appearance of your NanoMesh can be disorganized and seemingly random. One solution to align the NanoMeshes is to edit all the placement polygons one by one to change the vertex order. This would be time consuming, however. To resolve this, you will find the following alignment functions in the Tool >> NanoMesh sub-palette. These alignments make use of topology information to change the direction of the Nanos. To define the orientation of each instance, ZBrush uses the base (bottom) of the master model when it was created. All alignments refer to this original orientation. Align to Normal aligns each Nano based on the model’s surface normals. This alignment produces the best results in most cases. Align to Short Edge aligns each Nano to the shortest edge of the placement polygon. If a polygon has two or more edges of equal length, the point order will still be used to select the “shortest” one. It also uses the point order to determine the direction of alignment along the shortest edge. Align to Long Edge aligns each Nano with the longest edge of the placement polygon. If a polygon has two or more edges of equal length, the point order will still be used to select the “longest” one. It also uses the point order to determine the direction of align­ment along the longest edge. 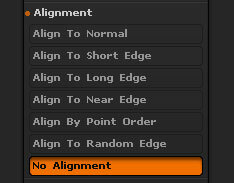 Align to Near Edge is a modifier for the Align to Long Edge option. Align to Point Order orients the Nano based on the position of the first vertex position in the placement polygon. The vertex order is a structural information within the polygon, with no visual influence on the polygon’s appearance. It is not possible to visualize the order of the vertices. Align to Random Edge aligns the Nano randomly. No Alignment uses the default alignment based on the placement polygon’s point order. As with all 3D models in ZBrush, you can apply colors to a NanoMesh. These func­tions let you manipulate how the coloring is applied. This is color being added to the Nanos rather than the master mesh. For instructions on texture manipulation, please refer to the UV section below. Mesh MRGB matches the color and material of each Nano to that of its placement polygon’s PolyPaint. Mesh Color matches the color of each Nano to that of its placement polygon’s PolyPaint. The Mesh Material matches the material of each Nano to that of its placement polygon’s PolyPaint. 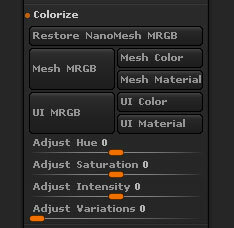 UI MRGB sets the color and material of each Nano using the Color >> Main Color setting and the currently selected material from the ZBrush interface. UI Color sets the color of each Nano using the Color >> Main Color setting in the ZBrush interface. UI Material sets the material of each Nano using the currently selected material from the ZBrush interface. The Adjust Hue, Saturation and Intensity sliders modify the colors currently being displayed on each Nano. These sliders will have no effect if the Nanos have no color applied to them. Adjust Variations apply a variation factor to the Hue, Saturation and Intensity values, assuming that any have been set. This function is very useful when wanting to add some slight differences in the color of each Nano so that they look less like instances of the same object. Not only can Nanos receive color and material from the placement polygons, the master copy of the mesh can also have a texture applied. This texture will then appear on all instances of the mesh. To have a texture applied, the mesh must have UVs. ZBrush includes functions to automatically produce UVs for each Nano based on the placement polygons. This means that the applied texture will look different for every instance! It is possible to create custom UVs for a NanoMesh through its Edit mode. This applies the UVs and texture to the master model, so all instances of it will then have the same UVs. Use Base Mesh UVs mode tells ZBrush to match the UV’s of each Nano with that of its placement polygons. This is accomplished by projecting from the placement. Use Base Mesh Texture mode projects the texture of the placement polygons onto the Nanos. As with other places in ZBrush, texture always has priority over the NanoMesh colors, over­riding any settings in the Colorize menu. The Inventory functions are dedicated to manipulation and conversion of the Nano­Mesh itself, such as the conversion from instances to real geometry or replacement of one NanoMesh with another. One to Mesh converts the current NanoMesh index to real geometry. This result can then be further edited with the various ZBrush sculpting and modeling tools. If your model has multiple NanoMeshes applied, use the Index slider or “<<” ”>>” buttons to first select the specific NanoMesh that you wish to convert. All to Brush creates a new ZModeler brush from all current NanoMeshes applied to your model. By pressing the M key, you should see all of these meshes as available objects for use with other models. The All to Brush function is available only if the model has a NanoMesh on it. It is not possible to perform this action on a model which only has inserted meshes. Replace NanoMesh from Current Brush replaces the current NanoMesh index with a different mesh, using your currently selected ZModeler, Insert­Mesh or IMM brush. This function simply replaces the inserted mesh. It won’t affect the various settings currently applied to the NanoMesh index. If your currently selected brush is an IMM brush or ZModeler brush with multiple meshes, you can choose the InsertMesh of your choice by pressing the M hotkey or by clicking the Brush >> Modifiers MeshInsert Preview button. This function is really convenient to replace a placeholder Nano with another model or simply to try out different NanoMeshes on a model. Delete One removes the currently selected NanoMesh by de­leting its index. If your model has multiple NanoMeshes applied, you must of course first use the Index slider or “<<” ”>>” buttons to select the NanoMesh that you wish to delete. Delete All function removes all NanoMeshes applied to the current model, deleting every NanoMesh index.